When I wrote a 2005 op-ed in the L.A. Times that was titled, “Shedding Stigma of the ‘Psycho’ Straitjacket,” I began a long commitment to writing about those of us who suffer from serious mental illness. As the headline in that piece suggested, I hoped to reduce stigma, to correct the manifold misconceptions about the mentally ill, primarily the false tropes that the mentally ill are violent or unemployable. I wrote then, as I have for the past 13 years, from the perspective of someone who was diagnosed with schizophrenia in the late 1990s, though I did not learn of that diagnosis until some years later when I ordered my 1999 admission form to the UCLA psych ward. I also wrote that 2005 piece from the perspective of someone with a family history of depression, psychosis and suicide (three suicides, all men), and from the perspective of a journalist, who was working at L.A. Weekly, where I had been employed since 1997. I recognize that writers and editors wish to attract eyeballs. Headlines are marketing devices, intended to bring in readers. I have written articles with provocative headlines too, and I too have begun with provocative leads. But the lead in the op-ed in the L.A. Times goes beyond being provocative. It is insulting. The writers, Grant Duwe, research director for the Minnesota Dept. of Corrections, and Michael Rocque, a sociologist at Bates College, obviously seek to diminish the cause of the mentally ill by suggesting that we, like fraudulent cult leaders, are trying to enforce a kind of slavish fealty from others. Further, Duwe and Rocque characterized our cause as a “meme,” as if the point that I and others have been making for years–that the mentally ill contribute positively to society and that we are more likely to be the victims than the perpetrators of violent crime–is no more than a fad, some passing fancy of no consequence and no merit. I can live with these insulting characterizations by Duwe and Rocque. Again, I recognize that, as an op-ed writer, I too can be cantankerous, a trait of many journalists. Besides the difficulty in verifying mental-health diagnoses from 100 years ago, when the field of psychiatry was new, I must point out that most other researchers have not found anything remotely approaching such a high correlation between mental illness and mass shootings or mental illness and violence. Studies show that, when the mentally ill are being treated for our illnesses, we are no more likely to be a threat to anyone than those who are not mentally ill. In addition, the seriously mentally ill, with no substance abuse problems, commit only 3% to 4% of violent crime. A recent article by Dylan Matthews in Vox summarizes many of these findings and cites the outstanding epidemiological work of Duke University Professor Jeffrey Swanson, whom I interviewed some years ago and who has studied the subject of mental illness and violence for decades. As Matthews wrote, “If you were to suddenly cure schizophrenia, bipolar and depression overnight, violent crime in the U.S. would fall by only 4 percent, according to an estimate” from Swanson. Nor should mass killings be blamed primarily on the mentally ill. It is likely that those with mental illness do commit a higher percentage of mass and serial shootings than other acts of violence, but the percentage is still relatively low. Vox’s Matthews refers to research done by Michael Stone, a psychiatrist at Columbia University, who maintains a database of mass shootings and estimates that about 22%, not 59%, of the 235 killers he has compiled were mentally ill.
Matthews also cites Northeastern University criminologist James Fox and his colleague Emma Fridel, who indicated that only 14.8% of the 88 shooters on their list of mass murderers suffered from a psychotic disorder. Why is it that Duwe and Rocque assume that people who commit mass murders need to receive mental-health care? Duwe and Rocque miss a very key point, which is that most of these mass shooters premeditate acts of violence, for which they show no remorse. They tend to be hateful men, filled with rage. Such people are unlikely to respond to psychiatric treatment because, at core, they are not mentally ill.
As Dr. Amy Barnhorst pointed out on “The Daily,” the New York Times’ podcast on Feb. 23, the very day that Duwe and Rocque’s column appeared in the L.A. Times, there is no medication for treating anger, resentment or hatred. 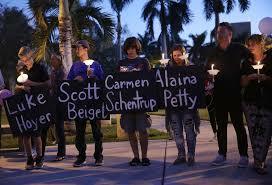 Most of these killers belong in prison, not a psychiatric ward! And even if these mass shooters have committed no crimes in their past, Congress and state lawmakers need to bar the sale of assault weapons to civilians. I see no reason why anyone outside of the military needs a military-style weapon. Yet Duwe and Rocque call only for a federal universal background check, rather than an outright ban on all semi-automatic and automatic weapons to the public. Incidentally, when I was hospitalized years ago, it was to help tame my severe depression and psychosis, as well as my suicidal ideation. These are the reasons why the vast majority of the mentally ill are hospitalized or otherwise in treatment. We have suffered not only from our mental illness; many of us have suffered because sadists have often committed violence against us, a pattern that sometimes begins in childhood and can continue throughout our lives. That has not stopped me from writing 300 articles or so since recovering from my psychotic breaks, nor has it stopped me from taking care of my angelic wife, Barbara, who has her own health issues. Neither she nor I is in perfect condition. I have my mental-health challenges, and Barbara has trouble walking and using her hands, due to spinal stenosis and arthritis. I recognize that I have undoubtedly hurt the feelings of some people over the decades. It is also quite possible that I have misread situations, which is common enough among those of us who suffer from psychosis. But I have never been violent, and I have never tried to hurt anyone. By contrast, most mass murderers, far from being mentally ill, far from being remorseful, are the sadists I alluded to before. Such killers get pleasure out of preying upon others. To illustrate my point about the difference between a killer, prone to cruelty, and a mentally ill individual, let me conclude by invoking Iago, the villain from Shakespeare’s Othello. I often cite him as a classic example of a killer, a psychopath, as opposed to someone who suffers from mental illness. As is the case with most mass shooters, Iago plans his acts of murder and violence and shows zero remorse for his despicable behavior. It might be helpful if Duwe and Rocque were to realize that most killers, including mass and serial killers, fit the profile of Shakespeare’s most evil literary creation. That is to say that most of the shooters in Duwe and Rocque’s database or any other database are likely to be cold-blooded murderers, scheming, calculating men, who plot to destroy the lives of others. They are a far cry from the mentally ill, who tend to be their victims.